Raymond Campbell manages the Island of Pabbay, a 2000 acre island off the coast of Harris in the Outer Herbrides off the West Coast of Scotland. 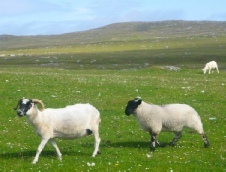 The island is now organic with 700 ewes, (Cheviots, Blackface and Suffolk cross) including 160 gimmers. Raymond, and his father before him, have bought Essie Suffolk rams for more than 15 years - 2 or 3 every year.